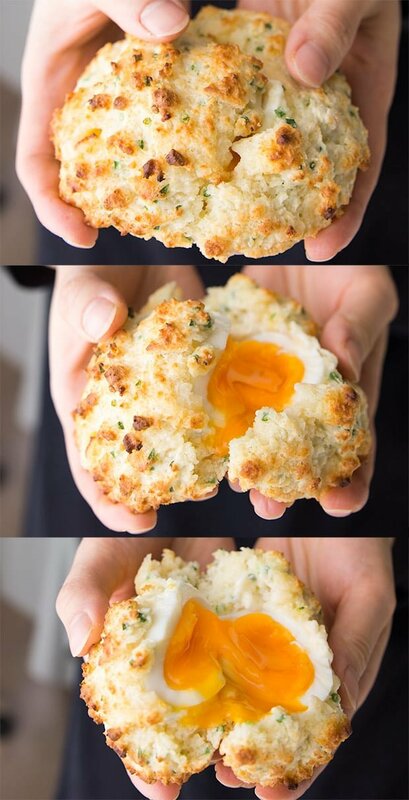 Moist fluffy cheddar chive biscuits with a soft boiled egg inside. My secret to getting an egg with a liquid yolk inside a biscuit. Today I’m going to share with you, one of the best things I’ve put into my mouth this year. It may not be much to look at from the outside, but crack these babies open and the fluffy cheddar and chive biscuit parts to reveal a soft boiled egg with a molten gold core. It may look like some kind of sorcery, but I assure you, there were no spells involved in the making of these magical biscuits. I wish I could lay claim to this brilliant idea, but I first saw something like this at Craftsman and Wolves in San Francisco, and I believe the idea comes from Texas baked eggs, where muffin tins are lined with biscuit dough and filled with a raw egg before being baked. The trouble with baking the eggs without being covered is that the top inevitably gets a little rubbery by the time the biscuit dough cooks through. By enclosing the whole egg in dough, it protects the egg, keeping it from drying out. 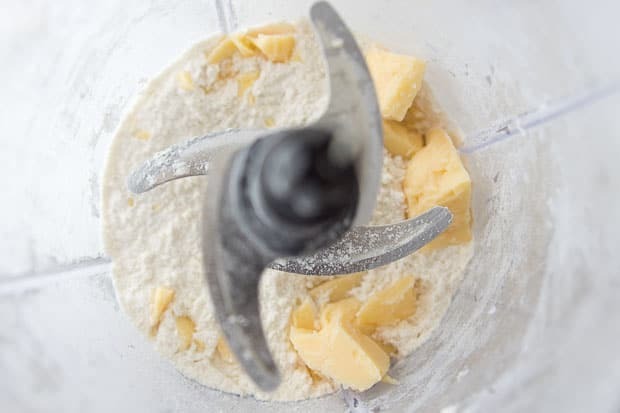 Of course if you’ve ever worked with biscuit dough you know it’s less a dough and more a batter in consistency making it virtually impossible to get a raw egg inside. The trick is to soft boil the egg and then chill it before baking the biscuit quickly at a high temperature. The little air-pockets insulate the egg, preventing it from overcooking, giving you a moist fluffy biscuit with a luxuriously soft egg in the center. 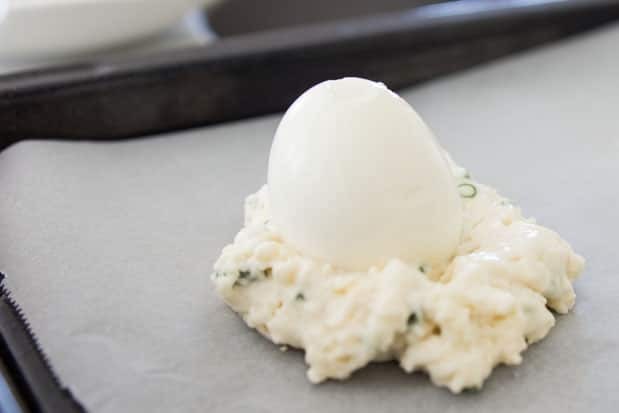 While wrangling a soft-boiled egg is easier than trying to wrap a raw egg, it still takes a bit of finesse to get right. With a little practice and a lot of flour (on your hands), it’s possible for mere mortals to get the egg inside of the cheddary biscuit. The real challenge here is to boil the eggs as little as possible while still being able to peel them. If the white starts falling apart while peeling the egg, it will be almost impossible to form the biscuit dough around the eggs, so if you’re not confident in your egg peeling skills, give my post on perfect boiled eggs a read and make a few extras. I’ve found that 4 minute eggs are pretty tough to work with, so I usually let them go for 5 minutes. Also, keep in mind that once you mix the yogurt and dry ingredients, the baking soda will activate, leavening the biscuit with CO2, but like a baking soda volcano, its powers are finite, which is why it’s important to work quickly once you’ve mixed the yogurt in. Lastly, using a good quality egg with a golden yolk is obvious, but most of the flavor in this biscuit comes from the cheddar, so be sure to find the best aged clothbound cheddar you can find. Adjust the oven rack to the middle position and preheat to 475 degrees F (245 degrees C). Line a baking sheet with parchment paper. 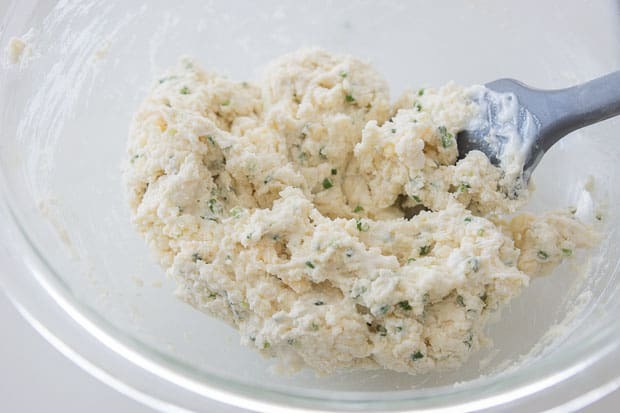 In a food processor, pulse the flour, sugar, baking powder, baking soda, and salt to combine. Distribute the butter evenly over the flour and pulse 1 full second at a time until the mixture resembles gravel. Add the cheese and pulse a few more times to break up the cheese, but be sure to leave some small chunks. Transfer this mixture to a bowl and stir in the chives. Shake (or whisk) the yogurt until it's thin enough to pour. Add the yogurt to the the dry ingredients and stir until just combined. It's okay if it's not 100% incorporated but be careful not to overmix. Working quickly, put 4 small circles of batter down on the parchment paper and top each one with an egg standing upright. Cover each egg with the remaining batter and place the pan into the pre-heated oven. Bake for 4-5 minutes and then turn down the heat to 400 degrees F (200 C) and bake until the biscuits are golden brown (about another 7-10 minutes). Serve hot, or transfer to a wire rack to cool completely. It’s good for a trip! Wow. I consider myself a bit of a biscuit queen who loves eggs, so this really got my attention. I’m not sure if I can pull this off, but I will be trying to. The egg peeling is going to be a challenge. I get my eggs from a farmer around here, so they have those orange yolks and are wonderful. Looks like perfection to me! I’m making this in the morning. I will eat them so fast and be so happy. i wanna try this with chunks of bacon in the batter. Hi Kaetchen, I’m glad to hear you enjoyed it. Soft boiled eggs will get a little flat once peeled, so it’s best to leave them in the shell until you’re ready to use them. As for the sugar, it’s in there for the same reason you add salt to sweet baked goods, it adds depth and balances out the salt in the cheese. A thing of beauty. Wow! I am completely in love with this. I am on a soft boiled egg kick and can’t wait to get these started! What about doing them with poached eggs? Hi Ad Hooc, it should work in theory, as long you you dry the poached eggs thoroughly using paper towels. I do think the shape will be better if you soft boil them though. If you give it a go, let us know how it goes. kyaaaaaa!!! for a budding foodie, your site is like heaven! I love that you put everything you need! Hello bookmarking haha! I deffo want to try these out! My trick for peeling eggs is dipping them into cold water. I’m not really sure why, but the shells peel off really easily and makes minimal mess! It also helps with getting a nice golden brown color. Same for pancakes. Leave out the sugar and they are too pale and pasty. 🙂 I am going to try this recipe for my family for breakfast. Thanks! Hi! I’ve made it and the dough has flowed… I don’t know why, do you have any ideas? Thanks. Thank you very much for your answer! I’ll try again! Hi Sansei Chef, personally I like the crust that you get from having more surface area with the freeform method, but you can absolutely do these in a muffin tin and it will make them much easier to shape them. You may want to use an over-sized muffin tin though so I’m not sure you’ll get a good egg to batter ratio with a regular-sized tin. I did this this weekend and it came out delicious!!! Thank you for this new Sunday staple! The one thing I would point out is that really any herb can be used in place of chives and any cheese (I did cheddar with rosemary), and have a ton of eggs on hand in case you screw up the first 8 like I did! Great point Addy, cheddar and rosemary sounds like an awesome combo! Hi marc – can these be reheated for service if cooled and I can’t serve them directly from the oven? Thanks for the great post! Hi Pat, they’re great at room temperature, but you could in theory reheat them in an oven (I would not recommend a microwave). You’ll just have to be careful not to overcook the egg. Made them – spot on. Nice job, great item! Thanks. Could this work just as well with hard (or almost)-boiled eggs? I’m not into the soft yoke, but these sound so GOOD! I am lactose intolerant, any ideas what I can substitute the yogurt with? Unsweetened almond milk would probably work. Though, you might want to reduce it to 1/2 c.
Yep absolutely, but you may want to boil the eggs just short of hard-boiled otherwise the time in the oven may turn the yolks green. You need the acidity from the yogurt to activate the baking soda, so you can substitute any alternative milk, like soy or almond, but you’ll need to add enough lemon juice to make it about as sour as yogurt. You may also need to cut back on the amount of liquid since soy milk will be much more watery than yogurt. Thanks! Can’t wait to make these! You may find that goat milk works for you. My hubby can’t have cow milk, but found the others like Rice Milk, Almond Milk, too thin to cook with, so we use goat milk. Is there a way I can prep these the night before, and pop them in the oven in the morning? Hi Cheryl, the baking soda in the biscuit dough will only be active for a short time once mixed, so you really need to bake them right away once you’ve added the yogurt to the mixture. 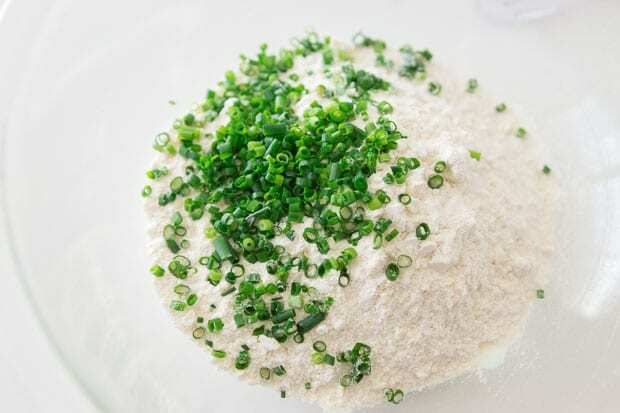 You could however boil and peel the eggs, do the biscuit mixture up to step 3(and keep it in the fridge), and have the chives chopped. Then all you have to do is mix the dry stuff with the yogurt and chives and form the biscuits. Hi VN, sorry to hear it didn’t work out for you. There’s a couple of possibilities. The first is that your batter was too thin for some reason (probably the thickness of the yogurt you used). Did the batter look like what’s in the photos in steps 6 and 7? The other possibility is that your egg was wet. If you washed your egg after peeling it and it was wet on the outside, your batter will not stay put.